Much of ground-based stellar astronomy and the magnetic field information that drives our understanding of stellar atmospheres and their variability depend on sensitive polarimetric measurements. Detailed solar atmosphere models, constrained by sensitive spectropolarimetry, are now being extended to 2- and 3-dimensions. For the last 15 years, the stellar and solar astronomy communities have benefited from the five previous "Solar Polarization Workshop" meetings where experts in theoretical quantum scattering, atmospheric modeling, and sensitive instrument technology were brought together to link and generalize our fundamental understanding of polarization and magnetic fields. The solar astronomy community is about to enter a new era with the construction of the first large aperture telescope optimized for polarimetry (the Advanced Technology Solar Telescope, or ATST). In June 2010, about 100 scientists and students met near the future site of the ATST on Maui to focus attention on advancing the science and technology that will accelerate our understanding of the Sun's and other stars' atmospheres. 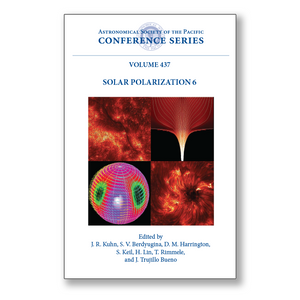 This volume captures the output of the sixth Solar Polarization Workshop in pedagogic reviews and detailed new results from this rapidly expanding field.